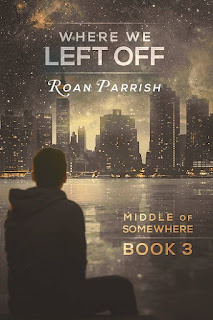 Roan Parrish is a new-to-me author. Below, I will state what was in the novel, and how it made me feel, and leave it up to interpretation whether the review is critical or positive, depending on the reader reading my review. No two readers read the same book, therefore elements in the novel will either be exactly what a reader is looking for, or they won't be to the reader's tastes. Individualistic. As an avid reader, it took me the better part of 5 days to tackle this 350-page novel, when normally I could do 3 books of that length in a day. It may have been my mood – but also, I felt there was no 'hook' in the novel itself, combined with the slow pacing. I have to start out by saying I loved the character development Parrish created for Daniel and Rex, and their initial and second-chance meeting. Daniel has a tough exterior and a fear of being vulnerable, both of which were instilled in him after being the youngest son of a beer-guzzling widower mechanic with 3 older brothers emulating said father. Being gay and cerebral were viewed as if Daniel felt himself above his family and peers, leading to a lot of bullying and hazing. This had emotionally stunted Daniel, but the young professor was mature enough to realize the how and why of his emotional state and try to overcome it. The reader knows Daniel more than Rex, because he is our narrator. I felt we just scratched the surface of Rex's perfection. Caring, giving, selfless, wounded, the vulnerable alpha. Rex is everything Daniel needs out of life. Perfect counterbalances. While I loved Daniel and Rex, and their little dog too, the story was missing the 'hook' that kept me engaged for all those pages. As I stated above, the book's pacing made reading it on the slow side. Other than a bit of tension and angst at the beginning, I just felt as a reader, that all those pages were dedicated to Daniel coming to a conclusion and Rex finally asking for a commitment. Not much happened between the couple but everyday situations, played on repeat, and some hot smexy times, which were played on repeat. I kept waiting for the other shoe to drop, because Daniel and Rex were so perfect for one another from chapter three forward. Only, I'll save you the worry – there was no other shoe dropping. The only conflict I personally felt was waiting for the conflict I was worried would appear on the pages, like miscommunication (which thankfully didn't happen, as I find it immature. Thank you, Parrish, for not going down that road). It's like a book in the middle of a relationship, without any conflict to be had. I need to repeat, I loved both Daniel and Rex, including their backstories, but frankly, I found them boring. The interesting side cast of characters had me wanting to skim-read to get to their stories, which I did not do. Daniel finding a young man being bullied and taken under his wing. Rex's friendship with Will. I was emotionally invested and engaged after the 80% mark of the book when Daniel's family and his BFF and her new boyfriend had some page-time. For me, In the Middle of Somewhere featured a sweet, romantic, 'perfect' couple with more interesting side characters, which had me looking at the percentage read way too often – where I was shocked at where the story could possibly go, as I always sensed every chapter felt like where the ending should be. Neutral is the emotion of this review. I enjoyed the story, the lovely characters, and am looking forward to the next in the series. I’m not exactly sure of how to review In the Middle of Somewhere. While it’s certainly a contemporary romance, for me it was more of a journey of self-discovery for Daniel. There’s no mystery to solve, no suspense elements to cause you to bite your nails, no dark past for either of the main characters, no huge drama that drives the story forward. That’s not to say that there’s no drama, but rather that the drama that occurs is what one could reasonably expect to encounter as a young man with his degree fresh in hand takes a job in another state, moving from a big city to a tiny town where he knows absolutely no one, and embarks upon his first real relationship with a man. After the first chapter, it’s a semester in the life of Daniel as he finds his way professionally and personally, and also finds his home for the first time since his mother died. I think one of the main reasons I enjoyed In the Middle of Somewhere is because I could relate to Daniel quite a bit. Unlike Daniel, I was fortunate in that I had my family’s support and encouragement while going to college. Like Daniel, when I finished my degree and found employment, I ended up having to move to an area where I knew no one, thus I could relate to his initial disorientation, his struggles as he tried to find his own way and develop the professional persona that suited him best. So I “got” Daniel in that respect, and because of that, I connected with him and was invested in his story, especially as he and Rex began to connect. As for Rex, I want my own Rex! He was absolutely perfect for Daniel. I believe it’s Rex who talks about how they complement one another, and it’s true. Rex is a nurturer, a natural caregiver, while Daniel is often too busy or in his head too much to realize it’s time to stop and tend to his needs, like eating. I enjoyed how Rex’s laidback nature helped calm Daniel. But what really struck me about the two men was that neither could fully grasp what the other saw in him and this seemed to bring an unexpected balance to the relationship as neither acted as though he had the upper hand in the relationship. As the story is told from Daniel’s point of view, there are times when he may come off as selfish and thoughtless. While I do not doubt there were occasions when he got caught up in what he was doing and worked longer than he planned (something I can relate to), Daniel is his own worst critic and his “faults and shortcomings” are magnified by the refrains from his brothers he hears replaying in his head. He judges himself harsher than those who care for him do, as evidenced by not only Rex’s interactions with him, but Ginger’s as well. While the circumstance that led to their meeting was devastating for Daniel, I was glad that Ginger and Rex got to meet and spend some time together. Not only because the only person in Daniel’s life whose opinion matters was able to give her seal of approval of Rex, but Rex picked up some valuable pointers from Ginger on how to deal with an obtuse Daniel (lol). I thoroughly enjoyed Robert Nieman’s reading of In the Middle of Somewhere. I use the term reading instead of narration because that’s how it’s phrased at the beginning of the audiobook and because that’s what it really was. Nieman doesn’t “perform” different voices for the different characters, and with how the book is written, it works. It doesn’t hurt that I love Nieman’s voice and have listened to the audiobook several times just to hear him read the story. In the Middle of Somewhere was a wonderful listening experience that made me fall in love the Daniel and Rex and left me wanting for Colin’s story. 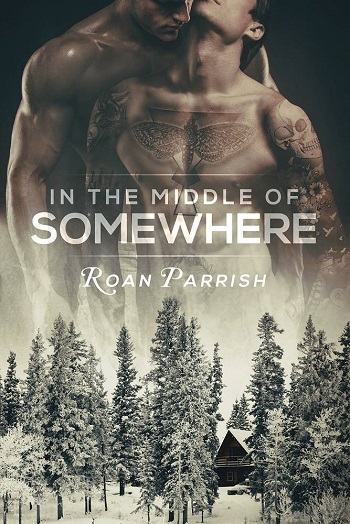 Reviewers on the Wicked Reads Review Team were provided a free copy of In the Middle of Somewhere (Middle of Somewhere #1) by Roan Parrish to read and review. Angela reviewed her personal copy of the audiobook.